Fox Networks Group Africa Proprietary Limited (“Company” or “we”), which can be contacted at the email address privacy.africa@fox.com wants to inform you about how we collect, use and disclose personal data from and about you, through this website https://foxsportsafrica.com and its associated mobile sites, applications and widgets (collectively, the “Company Services”). For further details with regard to the data processing carried out by the Company click on the links in each section of the summary. The Company might collect data from and about you. In particular, the Company collects (1) registration data, (2) public data and information you post, (3) data that you have permitted social media to share with the Company and (4) activity data. However, we do not collect either financial information from a payment service provider or sensitive data relating to you. For further information please read paragraph 2 below. The main reason why we collect data about you is to provide you with Company Services and to allow you to interact with such services. In addition, with your prior consent, we can send you offers promotions and marketing communications, including where they are based on your personal preferences and habits. For further information please read paragraph 3 below. 4. On what ground do we use your personal data? Your personal data is mainly collected in order to provide you with Company Services. Your personal data may also be collected to comply with applicable legal obligations and/or to protect the legitimate interest of the Company. Failure to provide such data will mean that it is impossible to offer and/or provide to you the Company Services. When your personal data is collected for marketing purposes, you have the option not to provide the Company with your personal data. For further information please read paragraph 4 below. The security of your data is a priority for us. Accordingly, the Company has implemented adequate administrative, technical and physical measures designed to safeguard your personal data against loss, theft and unauthorized use, disclosure of modification. For further information please read paragraph 5 below. The Company might share your personal data with (i) service providers, (ii) our Company Affiliates and (iii) national authorities, when allowed by the applicable laws. For further information please read paragraph 6 below. Your personal data may be transferred to countries outside South Africa where the Company or its service providers have operations, including to the United States. The Company will use appropriate and suitable safeguards compliant with applicable data protection laws to protect your personal data. For further information please read paragraph 7 below. According to the General Data Protection Regulation (EU) 2016/679, that became effective on May 25, 2018, give you have among others the right to request access to, to complete, to update, to amend and to delete your personal data. For further information please read paragraph 8 below. Your personal data will be generally stored in our systems for the period necessary to provide you with the Company Services. For further information please read paragraph 9 below. 1. Registration data is the information you submit to register for a Company Service. Registration Information may include, for example, name, surname, email address, gender, country, postcode and birthday date. 2. Public data and Posts which consist of comments or content that you post on the Company Services and the personal data about you that accompanies those posts or content, which may include a name, user name, comments, likes, status, profile information and picture. Public information and Posts are always public, which means they are available to everyone and may be displayed in search results on external search engines. 4. Activity Data. When you access and interact with the Company Services, we may collect certain information about those visits. For example, in order to permit your connection to the Company Services, our servers receive and record information about your computer, device, and browser, including potentially your IP address, browser type, and other software or hardware information. If you access the Company Services from a mobile or other device, we may collect a unique device identifier assigned to that device, geolocation data, or other transactional information for that device. Cookies and other tracking technologies (such as browser cookies, pixels, beacons) and Adobe Flash technology commonly called “Flash cookies”) may also be collected. These technologies may also be used to collect and store information about your usage of the Company Services, such as pages you have visited, content you have viewed, search queries you have run and advertisements you have seen. 5. Information from Other Sources. We may supplement the information we collect with information from other sources, such as publicly available information from social media services and commercially available sources. • Sensitive information: we ask that you do not send us, and you do not disclose, any sensitive personal data (such as social security numbers, information related to racial or ethnic origin, political opinions, religion or other beliefs, health, criminal background or trade union membership) on or through the Company Services or otherwise. k) Upon your prior consent – send to you marketing communications customized to your interests and needs by means of the channels of communication set out under letter j) above. • Section 3, letters j) and k) is discretionary, but without your consent, it is impossible for the Company and/or third parties to provide you with generic marketing communications of the Company and third parties services/products or communications based on your interests and needs and to provide co-branded services. You can revoke your consent to the processing of your personal data for the purposes as per Section 3, letters i) to k) at any time by sending a communication to the e-mail address of Section 11 below. Should you wish to withdraw your consent or object to marketing communications, please contact us at the email address at section 11 or, in the case of j) and k), select the unsubscribe link contained within any marketing communication. 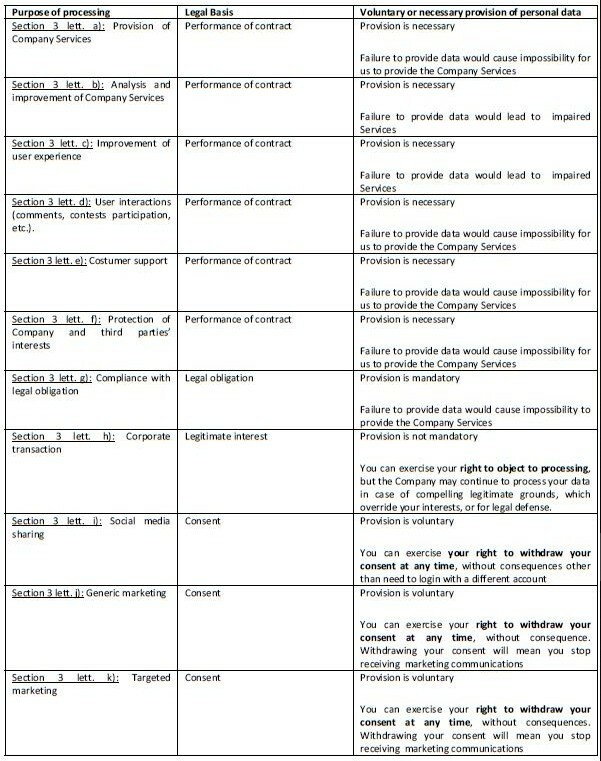 With regard to the above mentioned purposes, the data is processed through both electronic and manual means, and is protected through adequate security measures, taking into account the state of art, the costs of implementation and the nature, scope, context and purpose of processing as well as the risk of varying likelihood and severity for the rights and freedoms of individuals. With this regards, the Company uses appropriate administrative, technical, personnel and physical measures to safeguard personal data in its possession against loss, theft and unauthorized use, disclosure or modification. (“Company Affiliates”). For further information on Company Affiliates please contact privacycontact@disney.com . Your personal data may be transferred to countries where the Company or its service providers have operations, including to the United States. The Company will use appropriate and suitable safeguards compliant with applicable data protection laws to protect the personal information transferred and you may contact africa.privacy@fox.com to receive further information. g) lodge a complaint with the relevant supervisory authority. Remember that even after you cancel your account, or if you ask us to delete your personal data, copies of some information from your account may remain viewable in some circumstances where, for example, you have shared information with social media or other services or, for example, when retention of such copies is necessary to comply with legal obligation or legal defense. Because of the nature of caching technology, your account may not be instantly inaccessible to others. We may also retain backup information related to your account on our servers for some time after cancellation or your request for deletion, to comply with applicable law. In all the above cases, we may contact you and ask you for more information, that are necessary to properly handle your request. At the end of the retention period your personal data will be either cancelled, anonymized or aggregated.